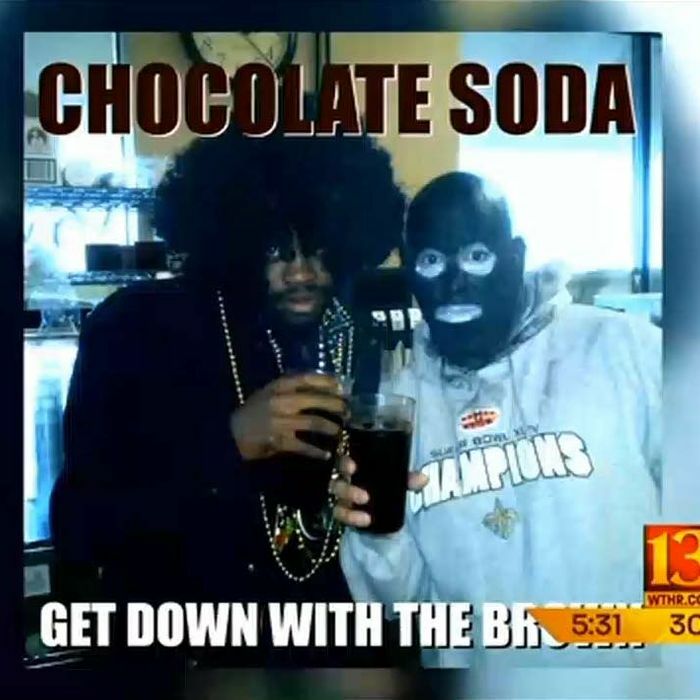 Art Bouvier, a New Orleans native who owns a Cajun restaurant in Indianapolis, claims to be genuinely shocked that people were offended when he posted a photo of himself in full-on blackface makeup, along with the phrases “Chocolate Soda” and “get down with the brown,” on Papa Roux’s Facebook page. “I could not be possibly prepared for the tensions I’m feeling today,” he tells local NBC affiliate WTHR, explaining that his makeup was actually in tribute to the Zulu Social Aid & Pleasure Club krewe, who’ve donned similar makeup, along with elaborate costumes, on Mardi Gras for more than 100 years. (By the looks of his gray sweatshirt, Bouvier seems to have left his krewe costume at home.) He further explains that “chocolate soda” was also not racist, but instead is a reference to the “newly introduced, locally-crafted” chocolate soda he’s holding in the photo.